I have been neglecting to write my recipes recently, and I feel so bad when I don’t put the time and effort into my blog. It’s like a guilty feeling welling up inside of me. I love to share things with you all, but somehow there just never seems to be the time to do so. My son just started creche recently as I prepare to get back to work. He is loving it and needed literally no time to settle in. I however needed time to come to terms with not being with him 24/7. I cannot describe how much I miss him when I am not with him. I hate that I have to go back to work and leave him to learn from and spend most of his waking time with someone else. I feel like I will miss so much. After losing our daughter Elena, every minute, cuddle, smile and tear with my son is just so so important. Anyway, Today is my last day to be productive while he is in creche and before I go back to work. I have spent the last few days baby proofing the house, deep cleaning and making it a nicer, safer home. I haven’t carved a pumpkin in years. So today I made a special one for my kids. But of course, I was left with a pile of mush and seeds at the end of it, not to mention the yellow stained hands (should have worn gloves!). So what to do? 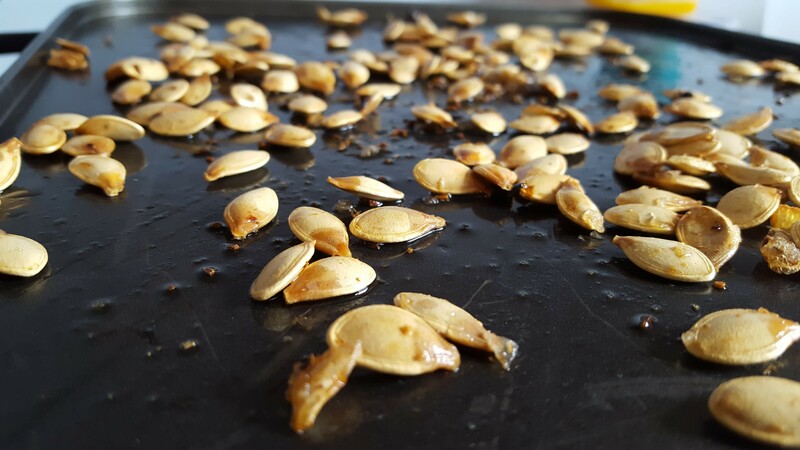 Well with actually having some time, I decided to make pumpkin puree for my son (just steam the flesh and puree) and then also roast up the seeds. And wow, they are delicious! 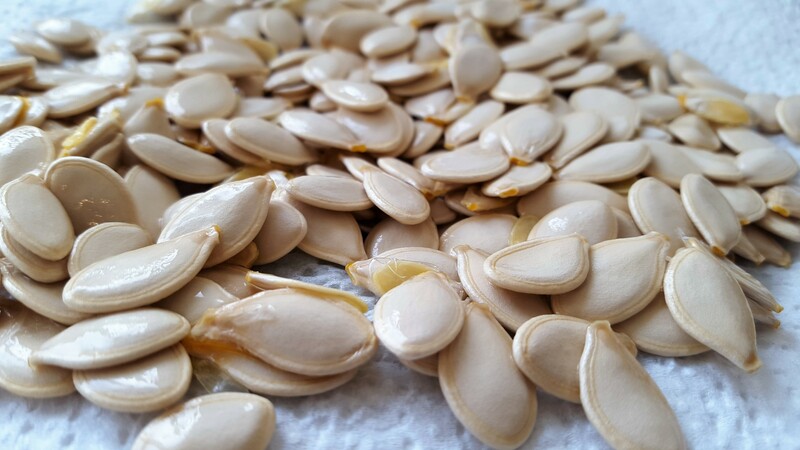 I wouldn’t go out and buy a pumpkin just to have fresh seeds, but while they are right in front of me, I couldn’t resist trying this out. 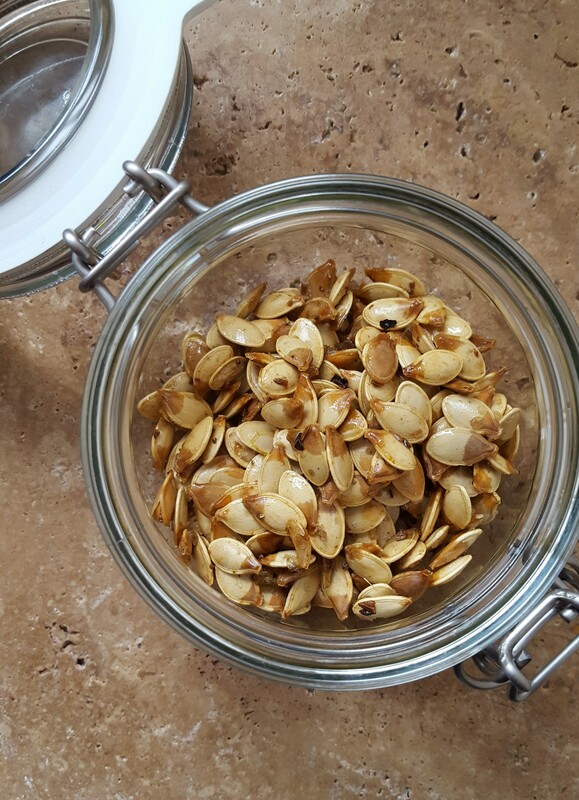 They taste a bit like a grown up version of popcorn to me, so instead of stuffing yourself full of sweets or treats this weekend, why not try these instead. Super yummy and brilliantly healthy too. Heat the oven to 180 C (fan oven). Wash the seeds in cold water and remove any stringy bits. Dry on kitchen roll (they will still be a bit sticky). In a pestle and mortar, grind the fennel and chilli up. 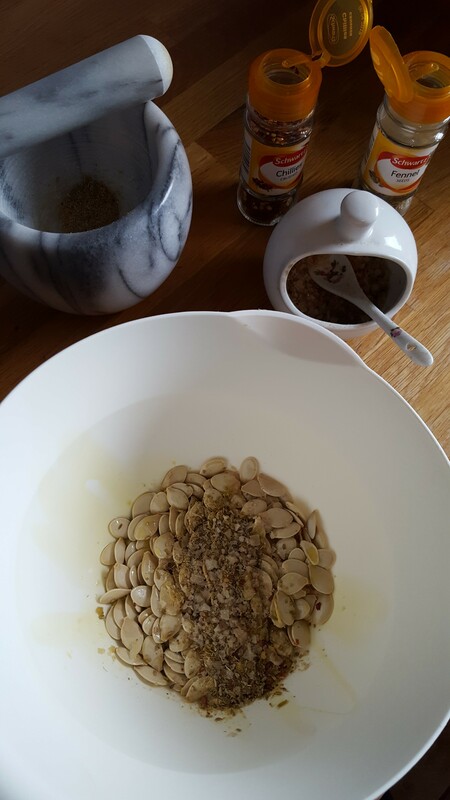 Put the seeds in a bowl, add the oil in, throw in the spices and add the salt. Give it a good mix and then scatter onto a baking tray. Pop them into the oven for 10-15 minutes until golden brown. I put them in for 15 minutes as I like them a little bit extra toasty. But I did check them and give them a shake after 10 minutes. Take out of the oven once done and allow to cool on the tray before putting them in an airtight container. And enjoy!